Professionally remove dents in hoods, fenders, deck lids, or any other sheet metal panel on your car, truck, or tractor. Simply plug Magna-Spot® into 115 volt 15 amp outlet, insert draw pin into stud gun, hold against clean metal surface, and press trigger for 1/2 to 1 second. Instantly, Magna-Spot® welds draw pin to metal surface where it can be pulled out using slide hammer supplied in kit. Once dent is pulled, grind off draw pin flush with metal surface, and finish with body filler. For large dents, several pins can be welded in a series. Moulding trim rivets for holding aluminum, stainless, or plastic trim clips can also be welded using the rivet electrode and rivets (included). Insert trim rivet into stud gun, place against clean metal surface until outer ring is seated, press trigger for 1/2 to 1 second; and rivet will now be welded to metal. After painting, plastic or metal trim clips will slide over rivets and hold your trim in place. Shrink high spots and expand small dents by using the shrink/expand electrode (included). Place Magna-Spot® Gun against clean metal surface until outer ring is seated, press trigger for 1/2 second, two or three times to heat metal. Generally, small high spots will disappear. If high spot does not shrink, tap lightly with body hammer. If a dent does not expand, apply a damp cloth to the heated metal to raise the surface. The Super-Pro Plus Magna-Spot® Gun Kit is designed with the professional restorer in mind. Features a more powerful gun, which is necessary when welding studs on older (thicker) body panels. Produces a high 2000 amp secondary current at the metal, which will ensure proper penetration when securing draw pins or trim rivets on heavier metals. If you restore old cars, go with the spot gun kit that has the power to perform! Kit includes: The Super-Pro Plus Magna-Spot® Stud Welder Gun, heavy-duty slide hammer, the Magna T-Puller for small dents, (250) 2.0 mm draw pins, (250) 2.5 mm draw pins, 150 trim rivets with electrode tip, shrinking/expanding electrode tip, 1/2 lb of Magna Wire and Electrode Kit for large dents using optional Magna Claw (call), instructions and a handy carrying case for easy storage. Ship wt: 27 lbs. Made in USA. As a hobbyist restoring antique tractors, I often run into gas tanks that have multiple ding and are part of the body. 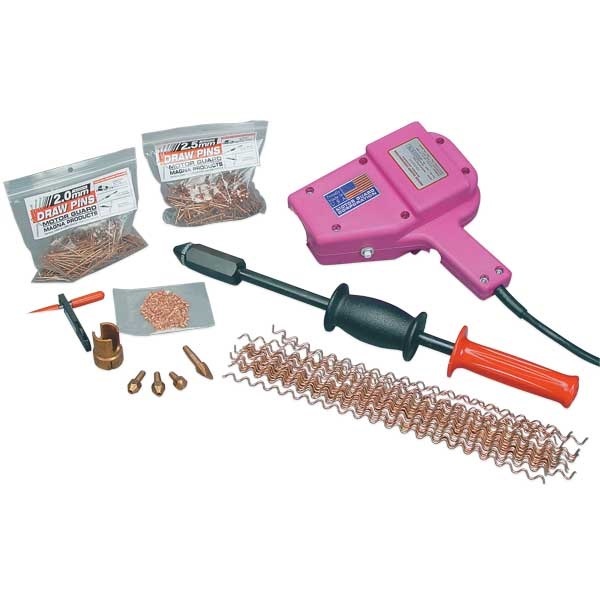 The stud welder is easy to use and allows my to pull the ding without damaging the the skin.